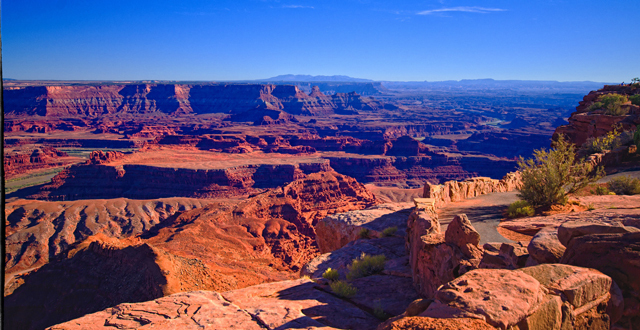 Moab is Utah's base camp for outdoor adventures; people come from all over the world to enjoy white water rafting, rock climbing, canoeing, hiking, cross-country skiing, jeep tours, and ATV riding in Moab's outdoor playground. Not to mention the fact that Moab is the mountain biking mecca of the world. If you are thinking about joining the fun let TravelWest be your guide. On this website you will find all the information you need as you plan your next trip to this outdoor lovers' paradise. Whether you plan to travel by train, plane, or automobile our transportation page has all of the information you need to get there, click on our maps page for detailed road and area maps. Located in the southeast corner of Utah, Moab sits in a deep valley along the Colorado River, beautifully nestled between red rock cliffs and surrounded by rugged desert terrain. Eighteen miles to the east sit the La Sal Mountains with peaks reaching up to 12,000 ft. Over 90 percent of Grand County is public land administered by the Bureau of Land Management and the Forest Service. This land is used not only for livestock grazing and mining but also for outdoor recreation. To learn more about the endless list activities that Moab has to offer visit our activities page. With over one million visitors each year, Moab is well prepared to put you up in an excellent hotel room, turn down your sheets at a nice bed & breakfast, hook up your RV, or point you to a great camp site. For more information about lodging options in Moab click on our lodging section. If you are looking for a good place to get a bite to eat while you are there our dining page will help point you in the right direction. Moab is home to over 50 restaurants and can serve up everything from a nice juicy steak to a quick sandwich, hamburger, or taco. If you want to learn more about the history of Moab, or just need to know where you can go to check your email you will want to visit our information page. It is full of great information about everything from the hospital and the temperature to the churches and public parks.